Ellen S. Mandell is a sole practitioner in Cleveland. Ms. Mandell has been an attorney for more than 30 years and her practice focuses on divorce and separation, child custody, support and visitation issues, as well as representation of professionals with disciplinary or ethical concerns. Ms. Mandell has been as a Guardian ad Litem for minor children in the Cuyahoga County Domestic Relations Court since the program began in the 1980's; she currently serves as a Guardian ad Litem. Ms. Mandell has served on the Grievance Committee for the Cuyahoga County Bar Association for more than 25 years and represented the Cuyahoga County Bar Association as it's Grievance Committee chair and as it's bar counsel from 2000-2008, representing the Bar Associating in ethics and professional responsibility cases before the Ohio Supreme Court and the United States Supreme Court. 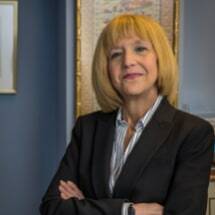 Ms. Mandell is also a past president and board member of the Cuyahoga County Bar Association and Treasurer of the Cuyahoga County Bar Foundation. She is currently a member of the Cleveland Metropolitan Bar Association and served on its Grievance Committee until 2014. She Currently serves on its Judicial Selection and Judicial Qualifications Committees. Ms. Mandell has served as an acting judge in the Shaker Heights Municipal Court since 2001.